Info "Put the mail in the mailbox." Going Postal is one of Kat and Ana's microgames in WarioWare: Twisted! The name is a pun on the term "going postal", describing an extremely angry person, usually in their workplace. The game's purpose is to get the letter inside a mailbox. If done so, the game is won. If the player misses, he or she will lose the game. 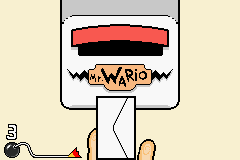 1st level difficulty: The mailbox is big, and the player must deliver it to Wario. 2nd level difficulty: The mailbox is a bit smaller, and the player must deliver it to Jimmy T.
3rd level difficulty: The mailbox is smaller, and must deliver to Kat and Ana. The letter is also almost curved like a cylinder. This page was last edited on November 16, 2018, at 21:59.